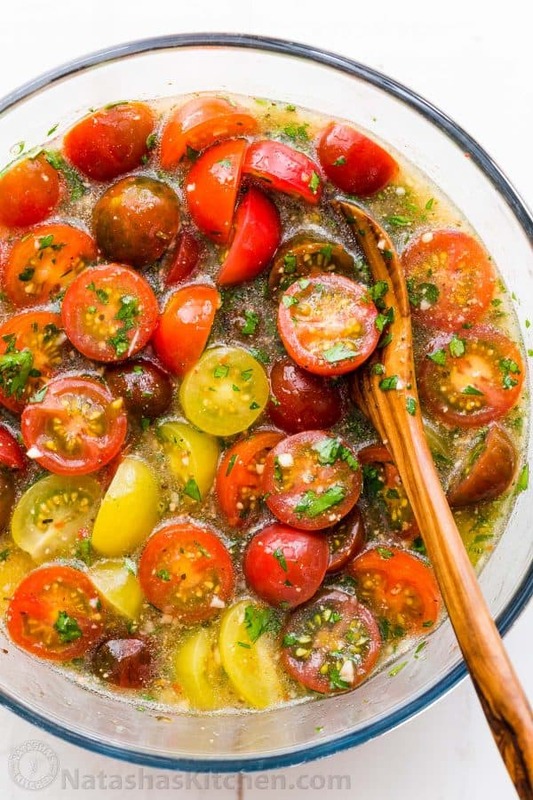 Marinated cherry tomatoes are a colorful, juicy and tasty side dish that is perfect for summer parties, buffets and large gatherings because it can be made hours in advance! This is one of our favorite cherry tomato recipes! This recipe has just 4 ingredients and the process couldn’t be easier! I hesitate to call it a ‘recipe’, but we all need quick and easy side dishes when we’d rather not be doing heavy cooking in summer. P.S. 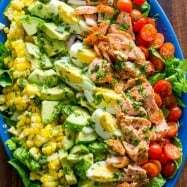 We have included Amazon affiliate links below for our favorite tools used to make this recipe. 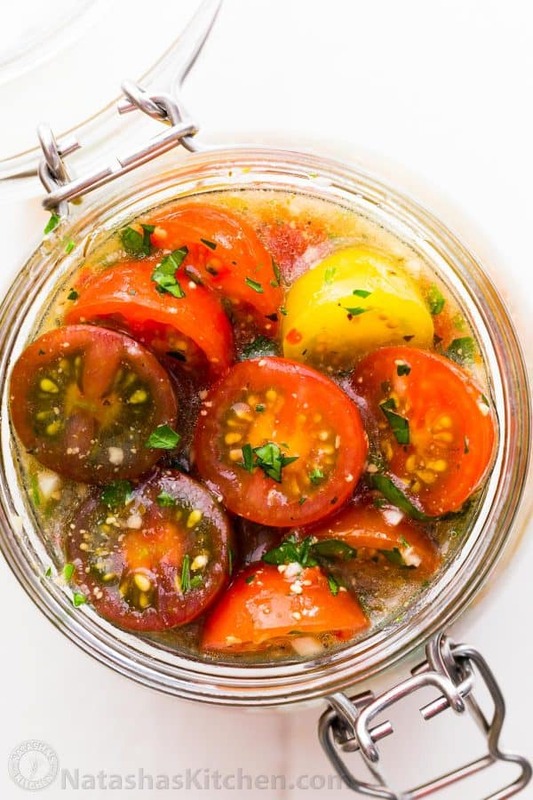 One of our readers, Olga, wrote in and shared this idea for these marinated cherry tomatoes. She takes it a step further; blanching and peeling the tomatoes before marinating. We equally loved them peeled or unpeeled so we are sharing the unpeeled easier method; just slice them in half and you are ready to roll! Thank you Olga for sharing this treasure of a recipe! We used the 2 lb pack of multi-colored baby tomatoes at Costco, but any cherry or even grape-sized tomatoes would work well in this recipe. Which Italian Dressing is Best? We used “Ken’s Steakhouse” LIGHT Italian dressing and loved that it had a little bit of parmesan in the ingredients. 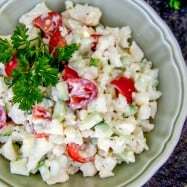 Olga who shared this recipe uses a “Zesty Italian” dressing. You can experiment and use YOUR favorite Italian dressing but I would suggest using one that is clearer in appearance (NOT CREAMY). You still want the color of your Italian marinated tomatoes to pop without disappearing into the marinade. If you have an option, select “Light” which will have less oil and more uniform marinating and is also less likely to solidify if refrigerated. 1. Rinse cherry tomatoes and cut them in half. It is easiest to slice with a serrated knife and I slice them through the center because they look prettier. 2. 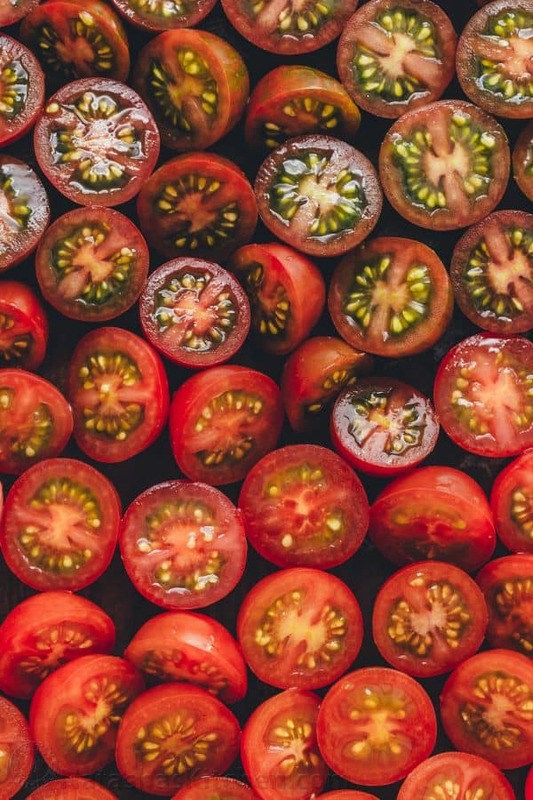 Add the sliced tomatoes to a glass mixing bowl or container (or right into a quart-sized glass jar with lid). Add the chopped parsley and garlic then pour over 1 1/2 to 2 cups of Italian dressing or just enough to barely cover the tomatoes. Stir and cover to marinate. 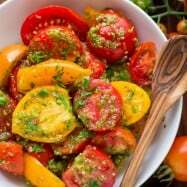 How Long should I Marinate Tomatoes? The tomatoes will be more flavorful the longer they sit and need a bare minimum marinating time of 2 hours. 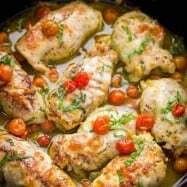 I cover and leave these on the counter at room temperature for 4 hours and serve – you will want to chill them after that if there are leftovers. They keep very well refrigerated overnight. 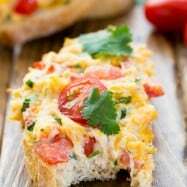 If you have leftover tomatoes or want to serve them with breakfast, try serving them as bruschetta. All you need are some toasted baguettes. So easy and good! 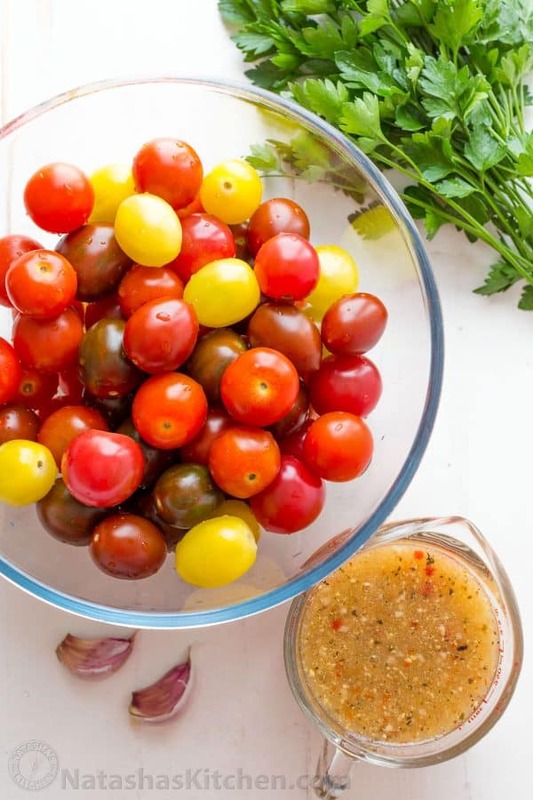 Marinated cherry tomatoes are a colorful, juicy and tasty side dish that is perfect for summer parties and entertaining because they can be made ahead! Let tomatoes marinate at least 2-4 hours. They are even better overnight. 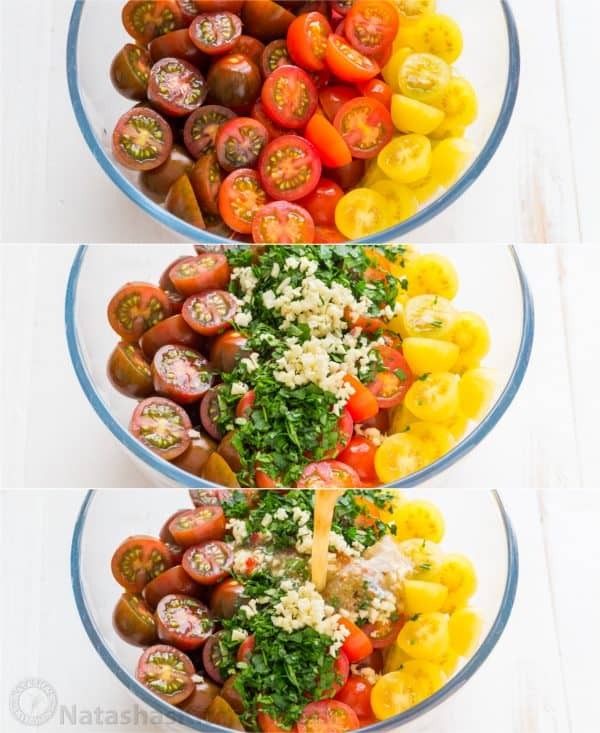 Rinse and cut cherry tomatoes in half. 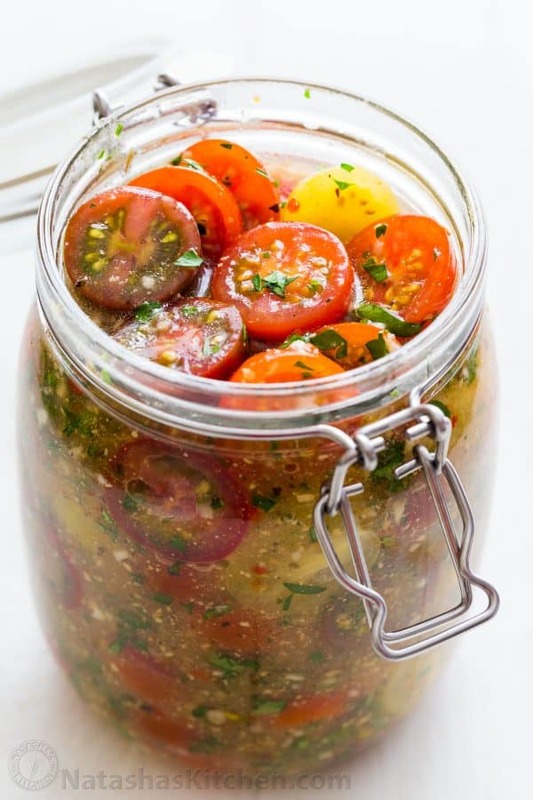 Add the sliced tomatoes to a glass mixing bowl or quart-sized glass jar with lid. Add chopped parsley and minced garlic then add 1 1/2 to 2 cups of Italian dressing or just enough to barely cover the tomatoes. Stir, cover and let sit at room temperature for at least 2-4 hours to marinate or refrigerate overnight. *Any variety or color of ripe baby tomatoes will work. **Do not use a 'creamy' variety of Italian dressing. 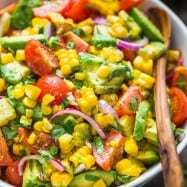 Q: Do you have a go-to summer side dish? I am always looking for new ideas and would love to hear from you in a comment below!! PS. Thank you so much for following along, trying our recipes, and sharing them with the people you love. Whether you are here for the first time or have been hanging out with us for the past 9 years, THANK YOU for stopping by! You are always welcome here.